Four Reasons Amateurs Don't Get Stronger(武宮正樹 の アマが強くなれない4つの理由 ISBN4-8399-1925-9) by Takemiya Masaki. MyCom(2007), 238 pages. Chapter 1: Four reasons for not getting stronger. Chapter 2: Make consistent plays. Chapter 3: Play moves that actually affect your opponent. Chapter 4: Don't play near strong stones. Chapter 5: Vital points of shape. Chapter 6: Build efficient groups. 4. Playing moves which build inefficient shapes. The core of this book is a collection of 50 whole-board problems extracted from actual high dan amateur games, each followed by several pages of discussion, selected to pinpoint these faults and their correction. Takemiya begins with prefatory remarks not unlike those in his 2008 Go Congress lecture: In summary, players who want to get stronger should focus not so much on winning as on experimenting with new techniques they are studying. Each game, even a painful loss, should be viewed as a learning experience. Takemiya expresses regret that most players aren't willing to play that way -- too much concern with winning is not go! With the attitude he recommends a player will, in fact, get stronger and win more games. But, in his view, the enjoyment gotten from continually making new discoveries about the game is the real point. White to play. Most amateurs, he says, would play , a stereotypic sort of move appropriate under certain conditions; but here it is terrible! First B and then W will jump out towards the center, at and , and then get into a battle to stay ahead. So W will be building thickness --or at least a kind of wall-- negated at birth by B's upper left shimari; and as the two groups expand south, they will also erase W's moyo. So the correct direction of play would be a move at a, b, or c -- precisely which doesn't matter. Then if B connects under with a move at or near d, he will have a low and overconcentrated position, which would suit W just fine. The chapter continues with discussion and examples of the other three faults. Moves with no effect are those which the opponent can safely ignore. "Strong groups" turns out to mean groups which are alive; so avoiding fault number 3) seems to be in keeping with Sonoda's basic dictum. The trouble with "inefficient shapes" is that the afflicted groups have unnecessary lingering weaknesses which, sooner or later, will cause otherwise avoidable grief. The problems themselves occupy chapters 2 through 6, with two chapters, 5 and 6, devoted to shape. As noted above, the problem positions are extracted from high dan amateur games, from fuseki through middle game. For most, a choice of continuations is not supplied in the problem statement. 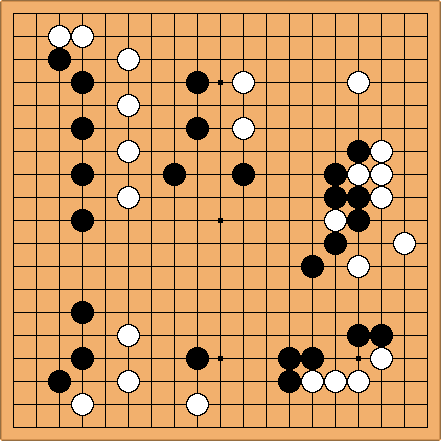 Takemiya usually focuses on a single good solution, but indicates when other moves from the same direction of play would be acceptable. (But here and there, especially in chapter 5, there is a unique move which "absolutely" must be played.) He discusses failure diagrams too, of course. The choice of positions is superb and should be interesting and attractive to stronger kyu-players, not just readers at the level of the original players. The problem diagrams are uncluttered, and in each one it is clear that something is waiting to be done. To my eye, at least, there are often two or more regions in need of a move, and the problem is to set a priority and then find an effective move in the chosen region. Takemiya's intended region is usually on my short list, but more often than I'd like, my ranking is wrong, and in most of those cases the issue turns out to be something fundamental, which has been affecting my own games. One disappointment is that the problem positions are not really explored in any tactical depth. There are typically six diagrams per discussion, containing both the solution and the wrong answers, but hardly any diagram seems to display more than one variation; and the variations that are given frequently extend no more than four or five moves, sometimes only two or even just one. Takemiya repeatedly stresses the importance of whole-board "sensitivity", so I suppose that the (very well presented) direction of play issues are what he feels to be his real message here, and that the required tactics are presumed to be familiar to his target audience. However, I cannot in any way fault the material that is actually included, and I recommend it to anyone who is single digit kyu or stronger, at least through low dan level. A strong player with only basic Japanese for reading go books, who has also briefly glanced at the page intermediate Japanese for reading go books, should be able to get full value from the problems. White to play. There is "absolutely one move" to play, very large. I will wait about a week before giving Takemiya's solution. Meanwhile there is a copy of the problem on the discussion page, where I hope it will be discussed before then.